The BEST creamy mushroom pasta! Made with a secret ingredient, this pasta is packed with savory umami flavor and ready in just 20 minutes! Save this for weeknight dinners. 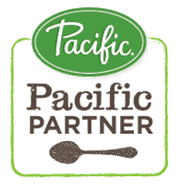 This post is sponsored by Pacific Foods, celebrating their nutritious and earthy Organic Mushroom Broth. It’s the secret weapon in this flavor-packed pasta! I’m so excited to share this pasta with you. It’s so simple, packed with savory umami flavor, fresh herbs and thick bucatini noodles. In other words, I don’t need to go on and on with how much you are going to love this, just make it. Then, come back so we can profess our love of pasta together. I’m a pretty good vegetarian: I love all the must-have items for mimicking a rich and meaty texture. Tofu and tempeh get equal love in my book, along with eggplant, lentils and of course- mushrooms. Sautéing these beautiful babies in a little bit of garlic and olive oil then tossing them with hot pasta is total perfection. I have to actively try and not to eat all of the mushrooms in the pan as they are cooking. As Julia Child once famously said, don’t crowd the mushrooms. It’s an important tip and one that I often repeat in my head when I’m cooking mushrooms. The key to getting that crispy outside is heating the olive oil, adding the mushrooms in a single layer and then letting them sit. A few minutes untouched will created the most beautiful crust. Flip and repeat. 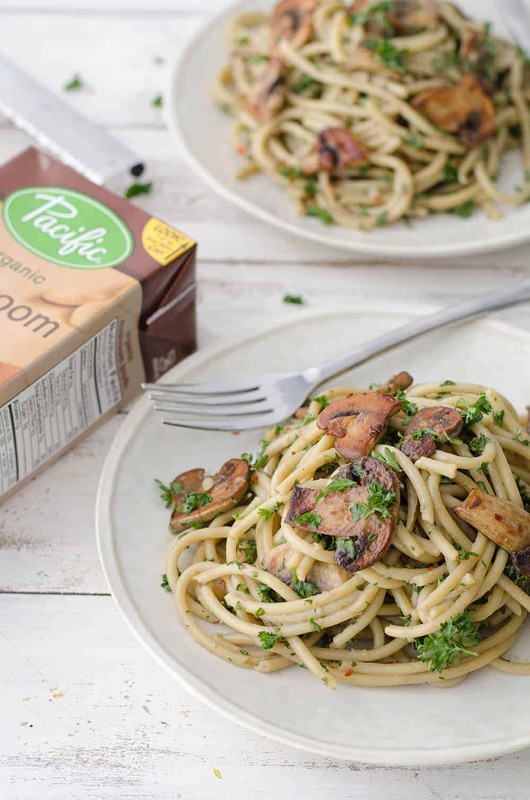 The other trick to this mushroom pasta is cooking the pasta in rich mushroom broth. Honestly, you almost don’t even need anything else. 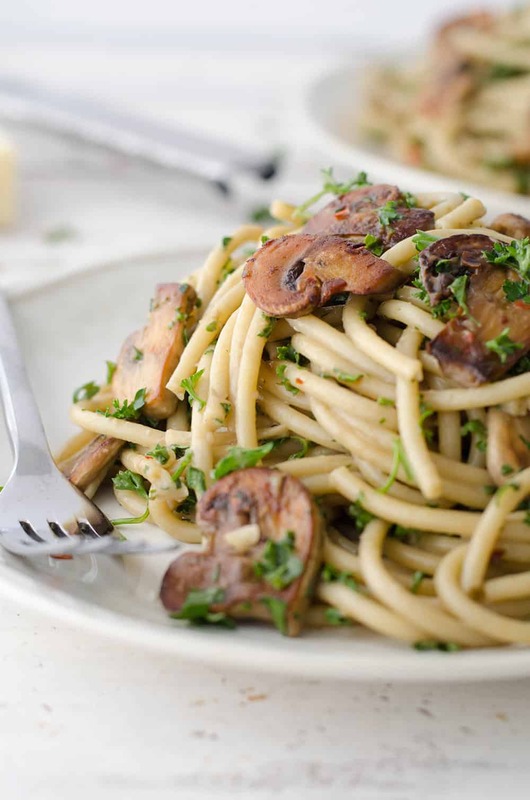 The pasta is completely seasoned by the mushroom broth, without having to add any extra salt or seasonings. 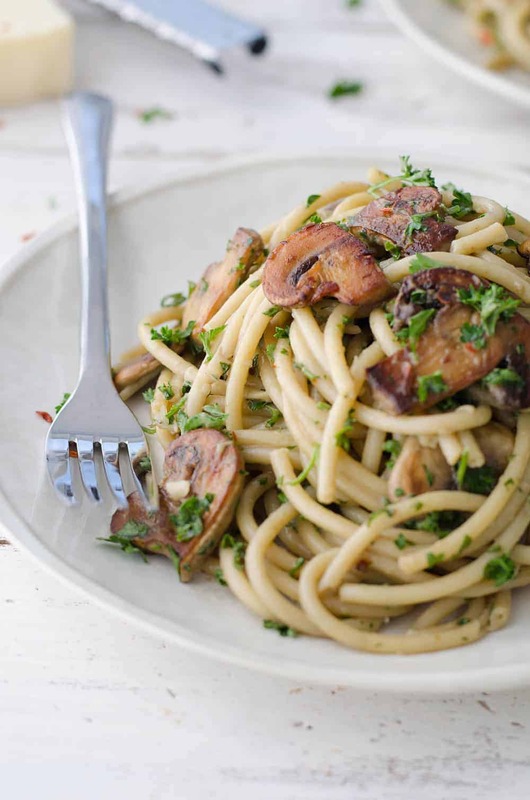 So, enjoy it like is (especially with a little bit of melted goat cheese or parm) or make it the way I do here, with crispy sautéed mushrooms and lots of parsley. 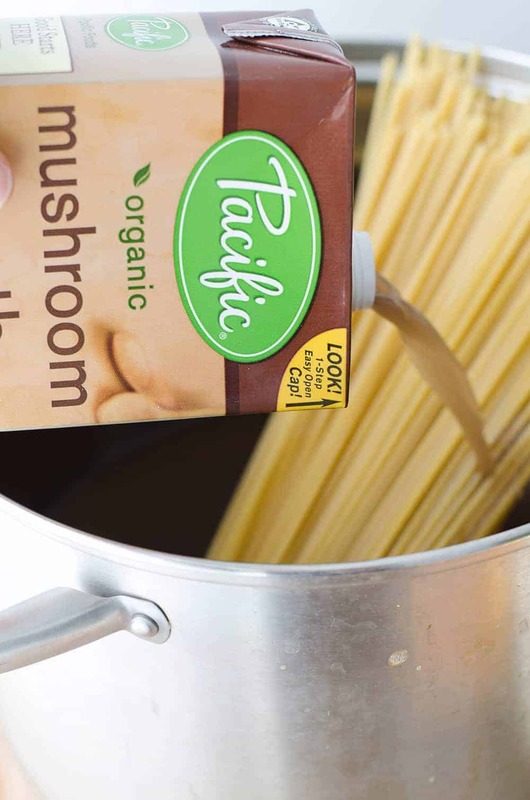 For the best tasting pasta, I used Organic Mushroom Broth from Pacific Foods. Savory mushrooms, garlic and sea salt combine to make the most incredibly flavored broth. It’s my secret weapon in this pasta and mushroom risotto. While it may be sacrilegious to cook your pasta in just 4 cups of cooking water, it does work. Less liquid also means your pasta cooking time is cut in half; no more waiting 15 minutes for a large pot of water to come to a boil. In fact, you don’t even have to bring the broth to a boil if you’re in a rush, as shown in this Food Network video. You can use a large skillet or pot to cook the pasta in, but make sure you stir the pasta often once it’s in the pan. Since you aren’t using a lot of water for the pasta to swim in, you need to make sure to stir often so the strands don’t stick to one another. If 2015 was the year of bone broth, 2016 should be the year of mushroom broth. A nutrient-rich, vegetarian alternative to the Paleo trend that’s about to have a major moment. Of course, mushroom broth is nothing new, but I’m glad to see it’s getting the recognition it deserves. 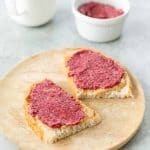 It’s an inexpensive, plant-based way to add extra earthiness and depth to any dish. Mushroom lovers, stand up! This weeknight pasta dish is for you. 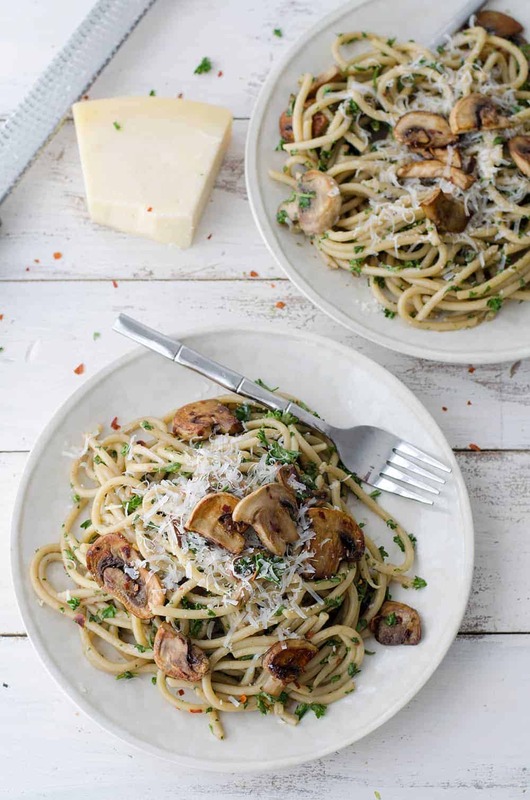 The BEST creamy mushroom pasta! Made with a secret ingredient, this vegetarian pasta is packed with savory umami flavor and ready in just 20 minutes! Save this for weeknight dinners. Place 3 3/4 cups mushroom broth plus 1/2 cup water in a large pot over medium-high heat and bring to a boil. Add the noodles, gently letting them soften into the liquid, then reduce heat to medium. Cook, stirring often until noodles are al dente and liquid is absorbed, about 10 minutes depending on pasta brand. While the pasta is cooking, heat a large skillet over medium heat. Add the olive oil and garlic and cook, stirring often, for 30 seconds or so until garlic is just golden, taking care not to burn. Add the mushrooms in a single layer and let sit for a minute or two so mushrooms can brown. Gently stir, then allow them to sit again to create a golden crust. Once mushrooms are tender, add in the remaining 1/4 cup mushroom broth and crushed red pepper flakes. Let cook until broth is completely absorbed. Whisk in the balsamic vinegar and heavy cream, if using. Season to taste with salt and freshly ground pepper, as desired. Add in the parsley and cooked pasta. Toss together until mushrooms and pasta are combined. Serve, garnish with parmesan cheese, if desired. This post was sponsored by Pacific Foods. As always, words and recipe are my own. Thanks for supporting the brands that I love and that make DK possible. I’m totally on board for the year of the mushroom broth (bone broth is overrated). I’ve never cooked pasta in anything but water… I need to try this recipe to experiment more! 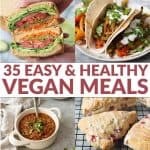 When does your cookbook come out!? I bet that the mushroom broth gives off an amazing flavor! LOVE it! It does! I wasn’t sure how much it would change the pasta, but it’s SO awesome. The plain pasta even without the sauce was really delicious.